Tis the season for a beautiful bouncing baby. 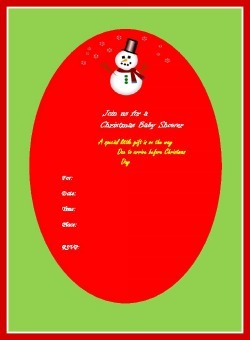 We would like to help you spread good cheer so we created these Christmas baby shower games. Ho ho ho! 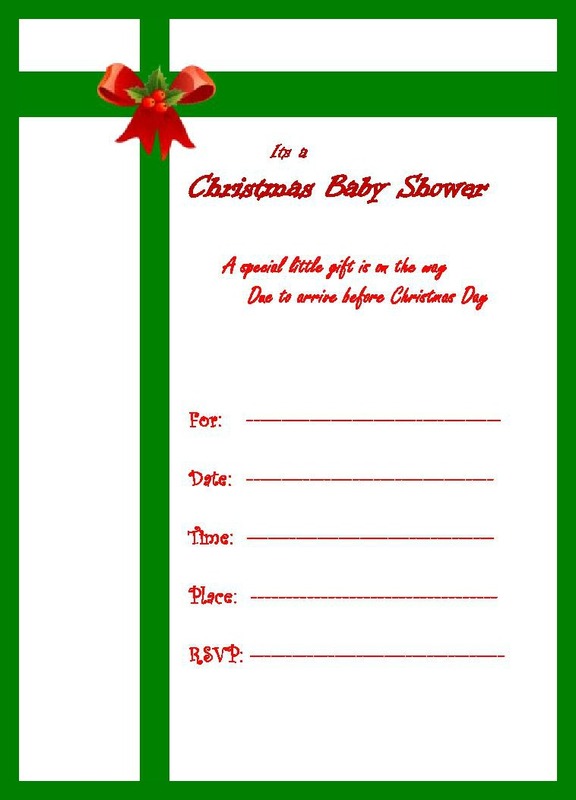 You can make your own Christmas baby shower games by using bright greens reds and golds. Christmas trees of all shapes, colors and sizes are in large supply at this time of year. Guests can write thoughts, wishes and advice for the new baby and add it to the wishing tree which mommy can then take to the hospital or place in the baby’s room. Be creative in decorating the tree. As one reader contributed, she used plain Christmas balls on her wish tree. Guests were given paint, glitter and other embellishments to write their advice for baby to have year after year. Fill a Christmas stocking with goodies for the new baby. Pass the stocking around the room so everyone gets a chance to feel for what is inside. Persons are not allowed to look inside the stocking or put their hands inside, they can only feel the stocking to try and guess its content. Hand out paper and pencil to everyone to record their answer so they don’t forget. The person with the most number of correct guesses as to what items are in the stocking wins. Get your guests to show their funny side by assigning them an elf name through the rest of the shower. Each person’s name is chosen base on the letter of the first name and the year they were born. 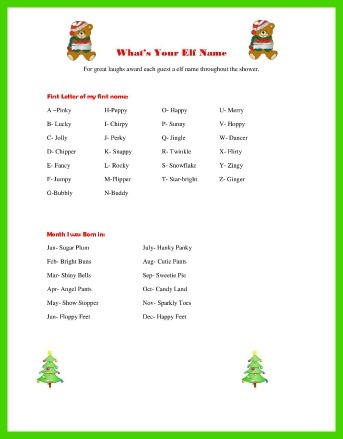 It’s extremely funny when gift time rolls around and each person give mommy their gift while using their elf name. You can penalize guests by having a “baby tip jar” for anyone who messes up and calls someone other than their elf name. Print the game sheet here to play at your party. Its christmas time and so its all the more fitting that a christmas baby shower party have wishes for baby cards. just to let everyone share their hopes for the new little person coming into the world. 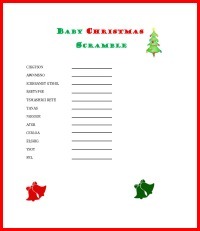 Get your guests ready to mingle to all your christmas jingles by playing baby christmas scramble. Its easy and fun and we made it super cute to delight your guests. How many words do you think you can find from "IT'S A CHRISTMAS BABY" ? well find out by letting your friends and family have a shot at it. You will be surprised how many words you find and how many you didnt. Give everyone 5 minutes to see how many words they can come up with. Then at the end of that time call out the words on the answer sheet provided and the person that has the most words win. you can also decide a winner by having a points system. 1 point for 2 to 4 lettered words, 2 points for 5 lettered words and so on. 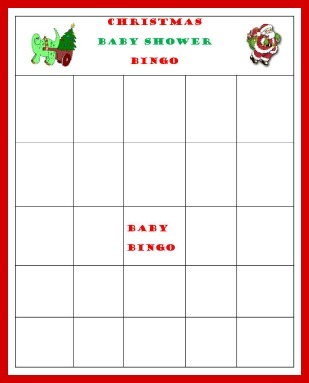 Bingo is a baby shower favorite so we made sure to make one available for all your guests to enjoy christmas style. 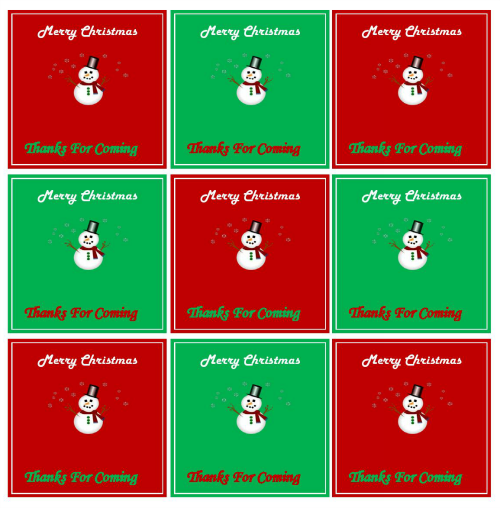 Christmas Carols are a long standing tradition and the season would not be the same without these jingles getting us in the festive mood. So bring a little festiveness to the party and ask guess to fill in the words to complete the title of the christmas carol. The person who guesses the most answers correct is the winner and gets bragging rights.